There is a hot new addition to the Shaw neighborhood catching the attention of local DC residents and press. 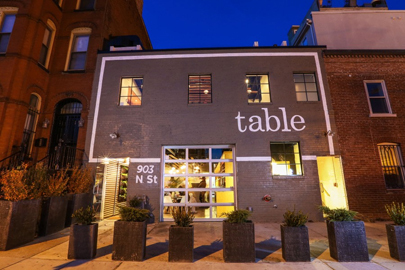 Table, which opened in late January, was named 2013’s Best New Restaurant by the Washington City Paper, and was recently added to Eater DC’s Heatmap. As soon as the restaurant started taking reservations, I set a date and invited the girlfriends, Mrs. Muffin, Miss. Zin, and Mademoiselle Za’atar (formerly known as Zin’s childhood friend) for a night of nourishment and gabbing. The approach to Table is impressive with its uniquely painted gray facade and white detailing. A dozen planters mark a roomy patio territory. The interior design is minimal with an unfinished cement floor, simple light wood tables and booths, a long galley kitchen with merely a countertop separating it from the dining room, and a light pink accent wall (I’m told painted in celebration of the cherry blossom season). Surprisingly the restaurant does not offer a bar area, as Miss Zin and I found out when we arrived early to catch up over a glass of wine. The restaurant is Chef Frederik de Pue’s labor of love, coming public after making a name for himself in the exclusive world of embassies and diplomats. His confident passion is revealed from the relatively spacious, exposed kitchen to the hand written menus that change frequently, not just seasonally. Diners are able to witness the creation process with all its humbling mistakes in an unpretentious atmosphere where the focus is on quality food. At any new food establishment, I am prepared to blaze the trail with an inquisition regarding gluten-free practices. To my pleasant surprise, it turned out our server was a glutie himself and was excited to guide me through the menu. He reviewed every item, most of which were naturally g-free or adaptable. He proudly admitted to influencing the chef’s fish soup recipe, which previously contained unnecessary gluten. The menu selections, with first course, main course, and cheese & charcuterie sections, are modest in number. 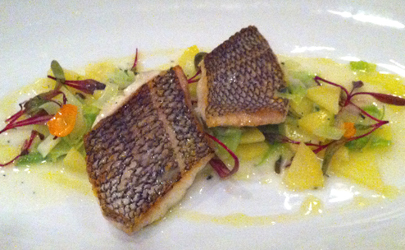 But each dish is unique and thoughtful—no filler items here. 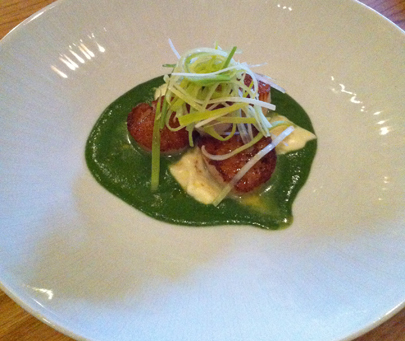 We started with the talked about seared sea scallops with parsley cream and leeks. Our kind waiter made sure our order contained 4 scallops, one for each lady, as these morsels were too heavenly to share. The parsely cream was subtly herbaceous and the leeks added pleasant contrasting texture. 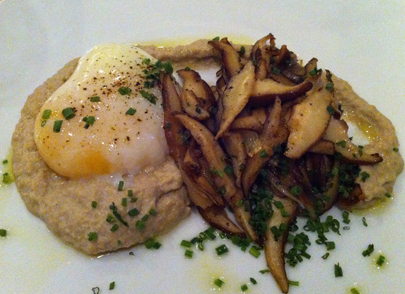 I paired two starters for my main course, the tuna tartare and the sauteed mushrooms with poached egg. 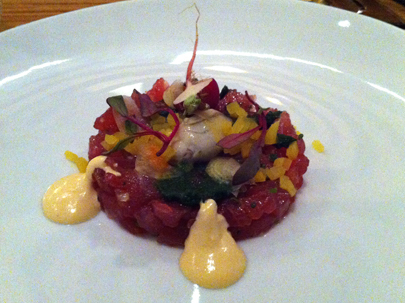 The tartar was prepared with uni sauce, pickled daikon and kimchee puree, topped with one plump oyster. The tuna was plainly seasoned and actually rather fishy, as was the entire plate between the fish, pungent oyster and uni (sea urchin) sauce. The kimchi puree offered bold flavor but could have used a compliment to keep it from overwhelming the dish. The mushrooms were a winner, even without the intended toast. The slightly sweet ‘shrooms were accompanied by a large oozing egg atop garliky mushroom puree that made this plate rather substantial and a real savory treat. Mademoiselle Za’atar’s pan roasted black bass with a ragout of potato and thyme butter sauce was cooked perfectly, preserving the fish’s delicate meat. 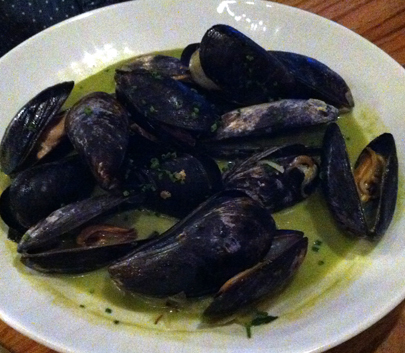 Mrs. Muffin’s bowl of mussels in thai cream was well balanced in flavor, allowing the muscles’ subtleness to shine through the sauce’s not-too-rich, complex flavor. 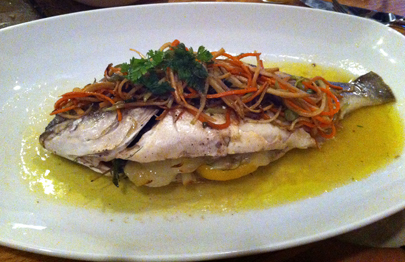 Miss Zin’s dorade en papillote (meaning, cooked in parchment) won for aesthetics. Covered in julienne vegetables (not g-free) the dish was full of flavor and color. Unfortunately Table’s dessert options are lacking for us gluties, with sorbet as the only option (how sick of sorbet are you!). However, with a little help from our gluten-free waiter advocating from the inside, perhaps change is in the air for this trendy little eatery. My biggest caveat with Table is the price tag. With a menu of star players priced relatively high, and no small sides or cheap fillers besides cheese and sliced meats, it’s tough to walk away without burning substantial dough. While the atmosphere conveys neighborhood dive, it’s a bit too pricey to become my casual, everyday haunt. Unfortunately escalated prices seems to be commonplace with the District’s growing population of foodie establishments. Categories: 4 Spoons, American, Dessert, Gluten-Free, Local, Organic, Seafood, Seasonal, Sustainable, Thai, Washington DC | Permalink. There is a small, inconspicuous Thai restaurant on 14th street that quietly chugs along while outside a tornado of new development and future competition engulfs the neighborhood. A product of Logan Circle’s first revival wave, Rice has been consistently cooking up high quality contemporary Thai cuisine for nearly a decade. The comfortable interior is chic and minimalist, with exposed brick and dark wood surfaces acting as a neutral backdrop for the colorful dishes prepared by Chef Lekki. Lekki’s innovative menu distinguishes Rice from the monotony of Americanized Asian cuisine. She offers dishes in three categories: authentic Thai staples, lighter vegetarian medleys, and unusual specialties that flaunt her creative muscle. On my most recent trip to Rice, I was thrilled to discover that a new category has recently been implemented due to customer demand. Rice has composed a gluten-free menu with a generous sampling of soups, appetizers and entrees adapted from the regular menu. While Rice has been more versed in the gluten allergy than most Asian restaurants I frequent, the designated menu confirms their commitment to providing safe and delicious food free of soy sauce and other wheat products. I eagerly scanned the many tempting offerings on the new g-free menu, items such as curries and soups that have been off-limits for years. Most Asian restaurants that accommodate gluten-free eating merely omit harmful ingredients, resulting in bland, sauteed whatevers. Rice goes well beyond the norm by preparing special sauces and dressings kept aside for us gluties. 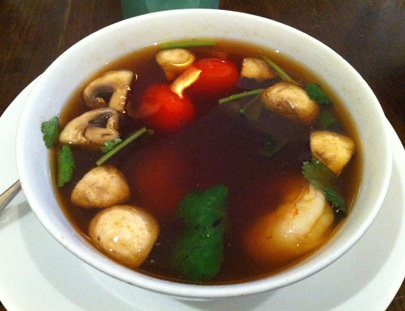 I was excited to order Tom Yum Goong, shrimp lemongrass soup. The sizable bowl of broth with bobbing mushrooms, cherry tomatoes, parsley and large steamed shrimp was heavily seasoned with a day’s worth of salt and an abundance of lemon juice. It was fresh and satisfying nonetheless. My soup was balanced with Rice’s famed brussels sprout salad, with spinach, walnuts and citrus soy dressing. Crispy brussels sprouts sit atop a bed of spinach, lightly dressed and sprinkled with slightly candied walnuts. 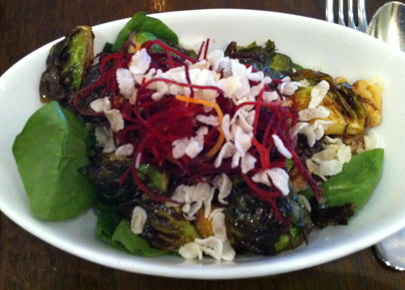 Beet shreds and crispy rice flakes adorn the dish, adding a burst of color and crunch. 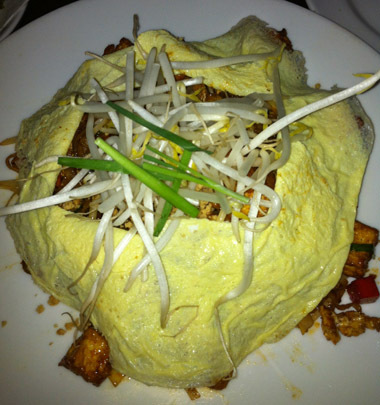 Rice’s pad thai puts all others’ to shame. The piping hot heap of noodles engulfs an abundance of tofu, chicken or shrimp, blanketed by a delicate sheet of egg and topped with sprouts, scallions and crushed peanuts. Each chewy bite delights the taste buds with a nutty, salty, sweet combination that makes this dish so universally loved. Rice exceles not only in food quality, but in presentation as well, proving the kitchen’s attention to detail from start to finish. I often find myself peering at other diners’ selections, taking notes for next time. In a neighborhood of new and exciting distractions, Rice knows the value of keeping its patrons wanting more. Categories: 4 Spoons, Asian, Gluten-Free, Lunch, Southeast Asian, Thai, Uncategorized, Washington DC | Permalink.